This absolutely glorious dress is fit for any function wedding, evening, brides, bridesmaids, prom, evening, cruises the list is just endless! 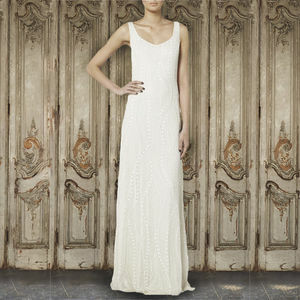 This beautiful A line chiffon dress has a beautiful lace bodice which has tonal and silver beading all over it. The gorgeous dress is sleeveless with a keyhole back. 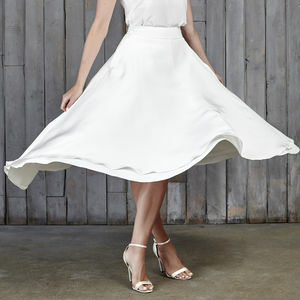 This dress comes in one colour: Ivory. Cleaning instructions: Specialist dry clean only on low heat. Size 4 (EU 30):Bust: 30" Waist: 24" Hip: 35" Waist-to-hem: 48"
Size 6 (EU 32):Bust: 31" Waist: 25" Hip: 36" Waist-to-hem: 48"
Size 8 (EU 34):Bust: 32.5" Waist: 26.5" Hip: 37" Waist-to-hem: 48"
Size 10 (EU 36):Bust: 34" Waist: 28" Hip: 38" Waist-to-hem: 48"
Size 12 (EU 38):Bust: 36" Waist: 30" Hip: 40" Waist-to-hem: 48"
Size 14 (EU 40):Bust: 38" Waist: 32" Hip: 42" Waist-to-hem: 48"
Size 16 (EU 42):Bust: 42" Waist: 36" Hip: 46" Waist-to-hem: 48"
Size 18 (EU 44):Bust: 44" Waist: 38" Hip: 48" Waist-to-hem: 48"
Size 20 (EU 46):Bust: 46" Waist: 40" Hip: 50" Waist-to-hem: 48"
Size 22 (EU 48):Bust: 48" Waist: 42" Hip: 52" Waist-to-hem: 48"
Size 24 (EU 50):Bust: 50" Waist: 44" Hip: 54" Waist-to-hem: 48"
This product is dispatched to you by Brand X.